This last Friday we took the bikes and some of our other kit, yes that does include the kitchen sink (or Ortlieb collapsible bowl at least), to Wallop Primary School to show the children. The Headmaster Mr Patterson kindly involved us in the weekly assembly, and then allowed us to explain our trip to the children. 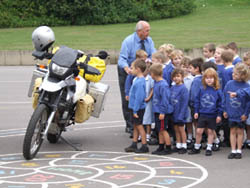 After assembly the children were taken out to the playground, and we rode on the bikes for them to have a look at, and the last of the questions were answered. The children will be following the route online, and they will very generously be raising money for Riders for Health. Hopefully they will be able to post some questions that we will be able to answer en route. Good luck on your travels.We have raised £8.10 so far in our class and hope to get much more. We will be following your journey on the map. Be careful. Thanks! Wow, that’s brilliant news. It’s lovely to hear from you and to know that you’re wishing us well. We will let you all know how we get on. Happy Christmas from all at Wallop School. We hope to see you when you get back to England. Congratulations! We are very pleased that you have arrived safely. We enjoyed your stories and hope that you have a good journey home. i went to wallop between 1966 and circa 1970 – when lt.col amyas biss was headmaster. my father, bill bousfield, had the veterinary practice on the old woking road in west byfleet – and amyas biss was one of his clients. i have very good reason to remember the school with affection – and am sorely grieved to learn that the premises have now been demolished in favour of a housing development (of all things). I remember boys such as Cole, Wilson, Collier, Eve, Brown, Day, Masterman, Zetterberg, Levison, Temple(r), Simmons, Woods etc. I cannot say how much I want to hear from these lads today – I ache to hear from them. The staff also are remembered – Hole, sterling, attenborough, robinson (who taught p.e.) etc. PLEASE, IF ANYONE READS THIS MESSAGE, GET IN TOUCH – MY TEL NUMBER IS 01403-265324 and my address is Well Cottage, 3 Goose Green, Warnham, Nr Horsham, West Sussex, RH12 3RS.